RecipeTips.com's video demonstration, 'How to Make Powdered Sugar Frosting,' has easy-to-follow instructions to create frosting for any of your desserts or cookies. Hi! This is Laurie from RecipeTips.com. Today, we are going to be making homemade powdered sugar frosting. Begin by adding two and a half cups of powdered sugar, two tablespoons of water, one tablespoon of butter, one tablespoon of a light corn syrup, and one teaspoon of almond extract. Start by mixing on low speed until the powdered sugar gets moistened, and then increase the speed to medium. If the frosting is coming together and it looks a little bit too dry, you can always add a little bit more water. Just add one teaspoon at a time until it reaches the right consistency. Now, if you add too much water, you can always add more powdered sugar. Scrape the sides down to make sure that you incorporate all the ingredients. Once it has reached the right consistency, it is ready to use. To make a colored frosting, add a few drops of a food coloring to the frosting. You want to do just a few drops at a time, because one drop makes a big difference in the color, and then just stir until it is all mixed together. 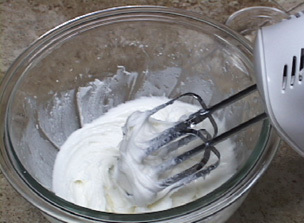 The frosting can be used to decorate cakes, cupcakes, or cookies. For more information on frosting, visit RecipeTips.com.